“By failing to collect data about women, designers and scientists look through the prism of the ‘default male’ — seeing men as the human default when designing products, medicines, our streets, and cities”. Women have been historically left out from data collection which is not only sexist, but puts women at much greater risk for all aspects of life. By leaving over 50% of the world’s population out of the research, they’re also left out of the solution. Criado Perez’ recent book, Invisible Women: Exposing Data Bias in a World Designed for Men, chronicles the ways in which the lack of data about women have put them at risk. For instance: Because there are no female-bodied crash-test dummies in the auto industry, seatbelt-wearing women in car crashes are 47 percent more likely to be injured than men. Not only is this a horrifying statistic, but an easily avoidable one too. Social infrastructure is the invisible glue that binds communities together. Left to fall apart, whole neighborhoods will crumble, but if you invest in social infrastructure like libraries, parks, or school, the results are remarkably life-giving. In the 20th century the broken windows theory was used to explain that people would feel more likely to get away with crime in a neighborhood with broken windows, which in turn, encouraged more crime. This theory was used as a justification for increased police presence, and later, stop and frisk policies. But what if instead the windows had been repaired? This is the question that The Pennsylvania Horticultural Society wanted to explore. The group began making simple interventions on abandoned lots like mowing the grass and creating pocket parks. The results were fascinating- gun violence dropped by almost 40% around the abandoned properties. When people see investment in their neighborhood, they’re more likely to respect it. A little love goes a long way. Be sure to listen to the full podcast episode to learn more! 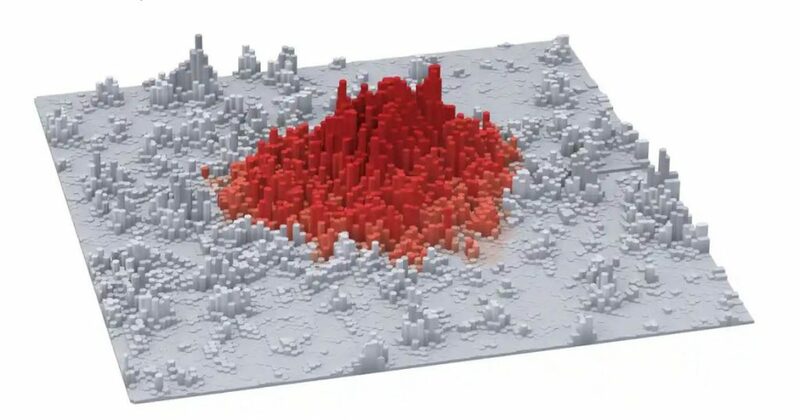 Cities Quiz: Can You Identify these World Cities from their Density Maps Alone? Can you identify this city based on its density? Plastic waste is one of the largest contributors to environmental degradation in the world and thanks to massive changes to America’s recycling program, things are about the get a whole lot worse. What exactly are these changes? Well, recycling programs across the country have been quietly shutting down. Philadelphia is now burning half of its recyclable material thanks to changes in global recycling markets. Up until 2018, China was a leading buyer of America’s recyclable goods which allowed the US to export a huge portion of their recycling overseas. After investigation, China determined that there was too much trash mixed in with the recyclable materials and they would no longer be purchasing them, leaving America with a nation’s worth of recycling to deal with. Hundreds of cities and towns across the US have cancelled their recycling programs or have limited the types of material they accept. This shift has spiked a deserved outcry across the States, daylighting the country’s recycling practices which many people were unaware of. US cities that have kept their recycling programs have now had to explore alternative end of the line options like burning. Maybe this will encourage a shift from single-use plastics and encourage circular product lifecycles rather than leaving municipalities to scramble for tail-end solutions. Rideshare services have completely disrupted our relationship to transportation, but whether or not they’re a good thing for cities isn’t an easy answer. Uber and Lyft have maintained contentious relationships with their drivers, bringing attention to the sometimes life-threatening stressors of precarious labour. Neither Uber nor Lyft consider their drivers as employees, but rather as independent contractors. This exempts them from benefits and makes it difficult for drivers to form unions. Last week, after an announcement to cut Los Angeles-based Uber drivers pay by 25%, hundreds of ride-share drivers held a strike in protest. “With the rates being so low, the only way to survive is to be constantly chasing surges” said one Uber driver. During surge hours drivers receive frequent notifications, which gamifies their relationship to work and encourages them to drop everything to chase the chance to make some more money. Both companies are preparing for an IPO in the upcoming weeks, and estimates suggest that Uber could be worth as much as $120 billion. Whether or not this strike will affect their valuation is too soon to say, but for a company that’s become embedded in the lives of people around the world, fair and ethical labour relations should be an absolute given.